Getting there: From central Austin, take FM 2222 west, past Loop 360. Turn left onto City Park Road and continue south to the Emma Long Park entrance sign. The parking area for the trail is two miles from the park entrance sign, on the right hand side of the road. The parking is right after a sharp turn in the road, so be prepared when you cross Turkey Creek to turn off the road. The Hike: The weatherman promised me that Sunday would be party sunny in the morning with afternoon showers. True to form, the opposite turned out to be true, but along the Turkey Creek Trail in Emma Long Park it turned out to not be as big a deal as expected. I started my journey at the trailhead marked by the waypoint of the same name on the topo map above. There were an unexpected number of cars at the parking area so it was obvious that any chance for solitude would be slim. 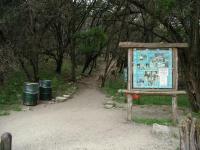 The trailhead includes an interpretive display informing hikers of the plants and animals one might find. 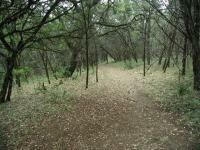 The path begins on the western side of the creek and quickly crosses it near a picnic bench within sight of the park road. Get used to crossing the creek, because you'll be doing it again and again. 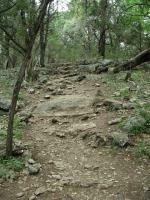 The trail follows the path of its namesake with tenacity. Only later in the hike will it wander away from the stream for a brief moment. 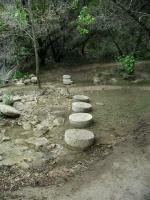 The numerous creek crossings are typically easy to master. 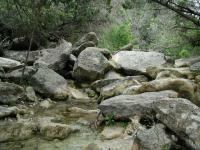 The numerous creek crossings turn out to be less of a deal than one might expect. 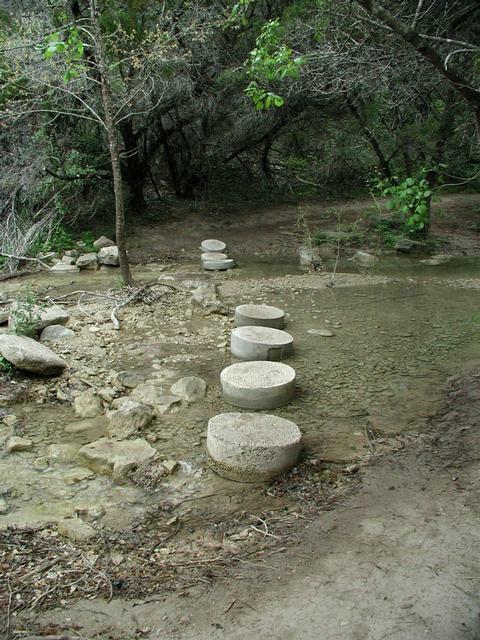 Where natural rocks are not in abundance to provide stepping stones, trail maintainers have left behind unnatural, though effective, concrete pads on the creek bed. 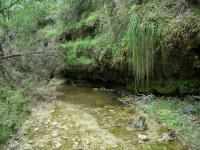 Given the trail's tendency to stay along the banks of the creek, the vegetation encountered tends to be a bit more varied than that found through most of Emma Long Park. The ubiquitous Cedar and Live Oak are joined by the more water-loving Cedar Elms and Sycamores. 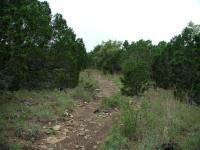 Mountain Laurels, Twisted Yucca and Agarita are also present. 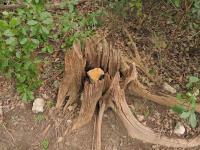 The most common life form on the trail was not a native plant or animal, it was the family dog. Turkey Creek seemed to be THE place to bring one's beloved pet for a weekend walk. 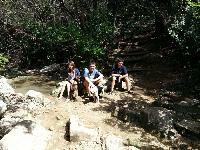 During the course of my hike I encountered perhaps 12-15 individuals or couples. Every single one of them had one or more dogs with them. The fact that I was the only person without a canine companion may explain why some of the dogs took pitty on me and decided to befriend me by hopping up and covering me in mud. 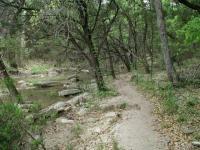 Most of the trail follows the creek, often closely. None of the dogs encountered were a problem, but if you don't like one barking at you then you may want to find another place to hike. In one instance a dog running point for his troop stopped and barked at me incessantly. His bark was not particularly menacing, though it was not exactly playful either. It struck me more of a "master, check this out. You won't believe this. There's a human up here and he doesn't have a dog" kind of bark. The apologetic owners explained that the dog seemed to have this complex with people wearing big hats. Now I was being offered fashion advice! 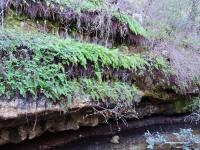 This grotto near the turnaround point features a wall of ferns. The trail forks at the waypoint "Y-L". By continuing to the left you'll not only follow the trail's mile markers in order, but you'll continue on a relatively modest ascent up the creek valley and save the steeper trail for the return path. 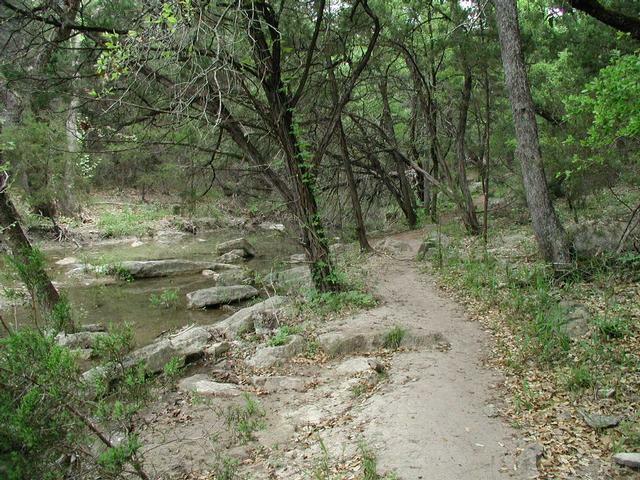 The return path ascends a bluff that overlooks the creek. 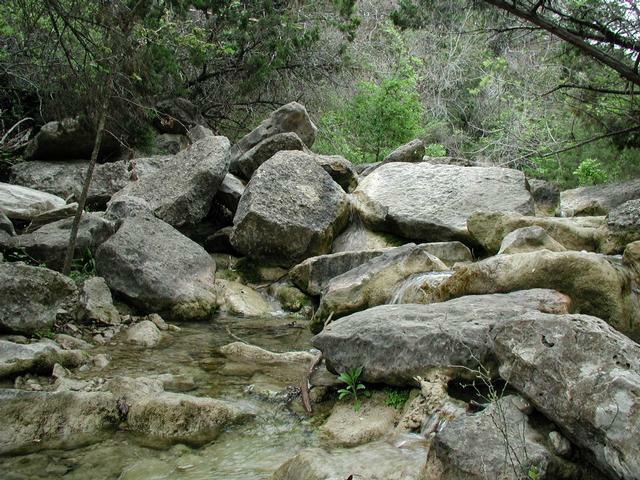 As the trail turns and heads south it leaves the embrace of the creek it quickly gains a bit of elevation and enters a whole new world. For much of the trail up to this point there is little open sky. The canyon walls and thick tree cover provided ample shade. Now at the top of the canyon rim the sky opened up. 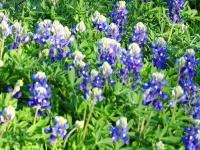 Small patches of Bluebonnets, conspicuously absent from the creek bed, are in abundance here, tucked between thickets of Cedar. A side trail leads a lookout point at the waypoint "View". One the day of my visit the drizzle and overcast skies didn't provide much of an incentive to stick around. 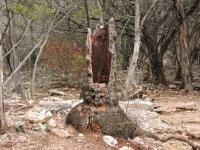 The tree cover of the creek bed below afforded more protection from the elements. 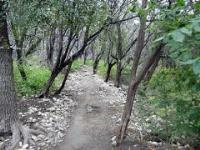 The trail continues to the south, descending back to the creek at the waypoint "Y-L". From here the trail retraces its steps back to the trailhead. 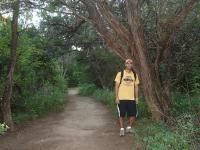 In all I recorded 2.3 miles of hiking. On top of the bluff the sky opens up. Upon returning to the trailhead I spent some time reading the instructive display at the trail's start. 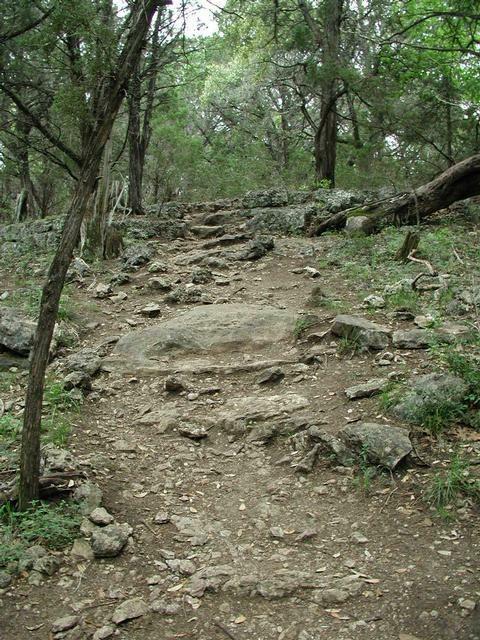 It included the usual facts about trail rules, a map of the trail, who Emma Long was (answer: the first female member of the Austin City Council) and some of the flowers one might see while hiking. On the far side of the back of the display is a simple sheet of paper printed with black lettering that states, "Welcome to Mountain Lion Country!" 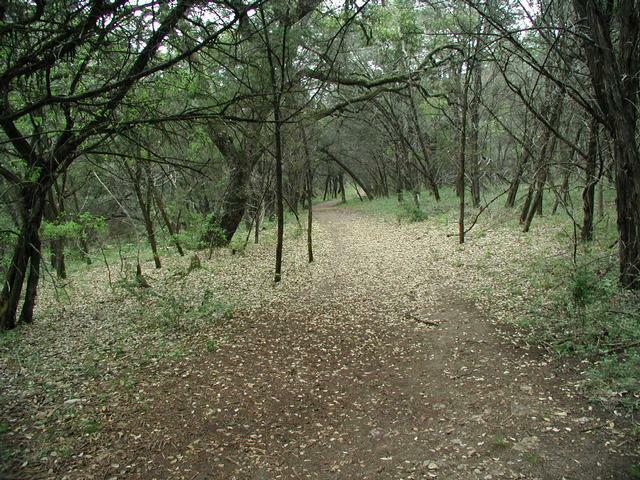 In April the path was often dusted by Live Oak leaves. Mountain Lions? In Austin? Shouldn't they let people know about this before they venture off into the bush?!? Actually, there's little to be concerned about. 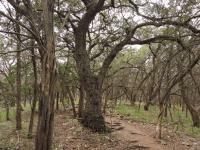 The number of sightings in west Austin have been low and Mountain Lions are typically more than anxious to get as far away from humans as possible. 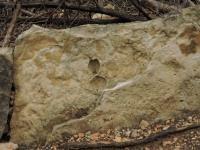 In the last 100 years only 4 attacks of Mountain Lions on humans have been recorded in Texas, none of them fatal. Let's put this into perspective. According to one report, in 1999 the Texas Department of Health conducted a study in which it received reports on no less than 599 "severe" attacks on people by dogs. Even more remarkable is that these reports came in from only 86 out of Texas' 254 counties. It's not an exaggeration to say that one is hundreds of times more likely to be attacked by a dog than a Mountain Lion. So be nice to Fido when you see him on this trail! We tried to go here today at 4pm, but they were at capacity and wouldn't let in anyone in for another hour. Something to think about on weekends. We ended up going to RiverPlace again, which is nearby. 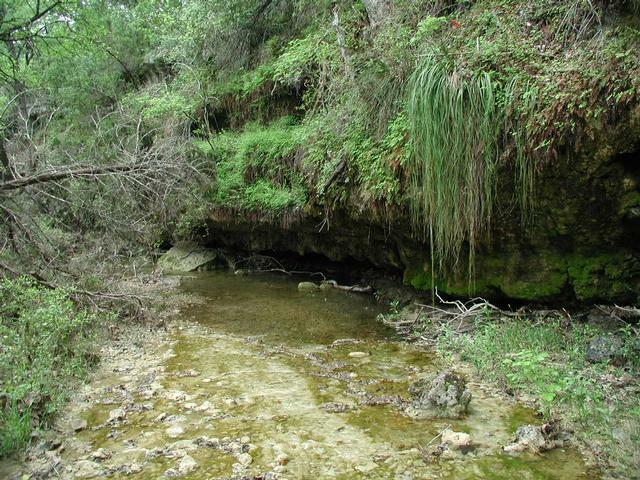 This is one of my very favorite hikes in Austin--the creek is beautiful, the woods smell of cedar (most of the time), there's an awesome wall of ferns, and because the trail's in a narrow little canyon, it's a few degrees cooler than most Austin hikes in the summer. From a non-dog-owner perspective, the trail's leash-free status can be a drawback--sometimes the first quarter-mile of the trail reeks of dog urine, and I've had a couple of scary run-ins with dogs that really shouldn't be roaming freely around people or other animals. OTOH, as you get further from the parking lot, things get a lot quieter, and the creek is so very pretty and cool. The poster who recommended wearing water-friendly shoes was spot on--it's much easier (and more fun) to wade across the creek than to balance on those wobbly stepping stones. Be sure to visit in the autumn to see the beautyberries in bloom. As a beginner I found the trail a good mix. Crossing the creek several times was a little bit challenging just because of some slippery or teettering rocks, but the worst result would have been a wet foot as the water was only inches deep at the time I was there. With the recent rains there was a lot of water to cross. There are stickers on every sign reminding us to be mindful of the nesting warblers so it probably won't be long until this park is closed too. 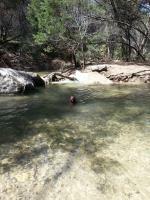 This was a great hike, especially for my dog! It's an off-leash trail with a lot of water, so we both had a wonderful time. Will definitely be visiting this one again!